Few children’s authors are as revered as Roald Dahl, creator of some of the best-loved children's stories of the 20th century, including Charlie and the Chocolate Factory, James and the Giant Peach and Fantastic Mr. Fox. One of Dahl's final books, Matilda, inspired a hit movie and now an acclaimed, award-winning musical, which opens on April 11 at Broadway's Shubert Theatre. Below, Broadway.com examines how this exhilarating story made its way to the stage. A recurring theme in Roald Dahl’s work is a precocious child who battles villainous adults, often in a school setting, since Dahl himself had been miserable at boarding school in his native Wales. Published in 1988, Matilda centers on a bright little girl with greedy, dimwitted parents (the aptly named Wormwoods) who don’t understand why their daughter prefers books to watching the "telly." In addition to her neglectful parents, Matilda runs afoul of hateful headmistress Miss Trunchbull at Crunchem Hall school but finds a loving ally in her teacher, Miss Honey. Meanwhile, our young heroine is developing telekinetic powers that she uses to stymie the evil grown-ups. 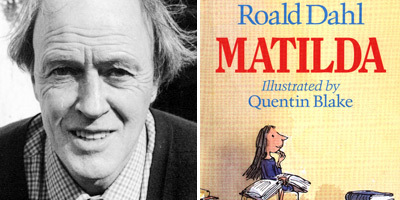 Asked about Dahl’s appeal to young readers, Matilda illustrator Quentin Blake told U.K.’s The Independent, "He was mischievous. A grown-up being mischievous. He addresses you, a child, as somebody who knows the world. He was a grown-up—and he was bigger than most—who is on your side." Dahl died in 1990 at age 74, six years before his story hit the big screen. Actor/director Danny DeVito discovered Matilda when his 10-year-old daughter Lucy (now an actress) brought the book home in the early 1990s. "I thought if I ever could make a movie for my kids, this would be the one," he told The Chicago Tribune, "and I thought the Wormwoods would be wonderful parts for Rhea [Perlman, DeVito’s wife] and me." 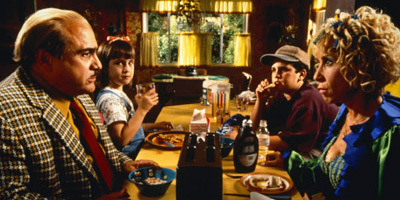 Released in 1996, DeVito’s film focuses heavily on Matilda’s telekinetic powers. Mara Wilson (Mrs. Doubtfire) is believably sweet and rebellious in the title role, and DeVito’s kindly voiceover provides a reassuring contrast to his nasty onscreen character. But Matilda also embraces the book’s dark side: Trunchbull (British actress Pam Ferris, filmed in brutal close-ups) instills fear in the students of Crunchem Hall by throwing the "squirming worms of vomit" and "villainous sacks of dog slime" out of windows or locking them in the "chokey," a steamy closet with nails sticking through the walls. Aimed at the tween crowd, the film was well reviewed but something of a disappointment at the box office, earning slightly less than its $36 million budget in its initial U.S. release. Matilda’s journey from novel to musical began when the Royal Shakespeare Company approached Dennis Kelly, a theater and TV writer, to create an adaptation, with a score to be added later. Kelly was an unusual choice since he had never written the book for a musical. A year and a half later, his script was presented to Tony-winning director Matthew Warchus (Ghost, God of Carnage). Now all they needed was a songwriter. "We kept saying, 'It’s about a genius, and there’s got to be some genius in the songs,'" Warchus told The New Yorker. When the director went to London’s Bloomsbury Theatre to see a one-man show by Tim Minchin, an Australian musician and comedian, he knew he had found his composer. Already a huge Dahl fan, Minchin had read Matilda in 2000 and thought it was well suited to be adapted for the stage. After several workshops during which Kelly got a crash course in how songs fit into a musical libretto. Matilda premiered at the RSC’s Courtyard Theatre in Stratford-upon-Avon in November 2010. Critics and audiences loved it, and the production transferred to the West End’s Cambridge Theatre, where it opened on November 22, 2011. Warchus’ shrewd decision to cast a male actor, Bertie Carvel, as Miss Trunchbull added an extra dimension of evil to the character, as well as an unexpected air of girlishness. "Trunchbull's a composite of characteristics—some horrible, some more sympathetic—which are drawn from my experience," Carvel told Broadway.com. "Everybody experiences bullying, the abuse of power and the jaded worldviews of adults… Those are the things Dahl wrote about, and that's what makes his writing and this show so delicious." 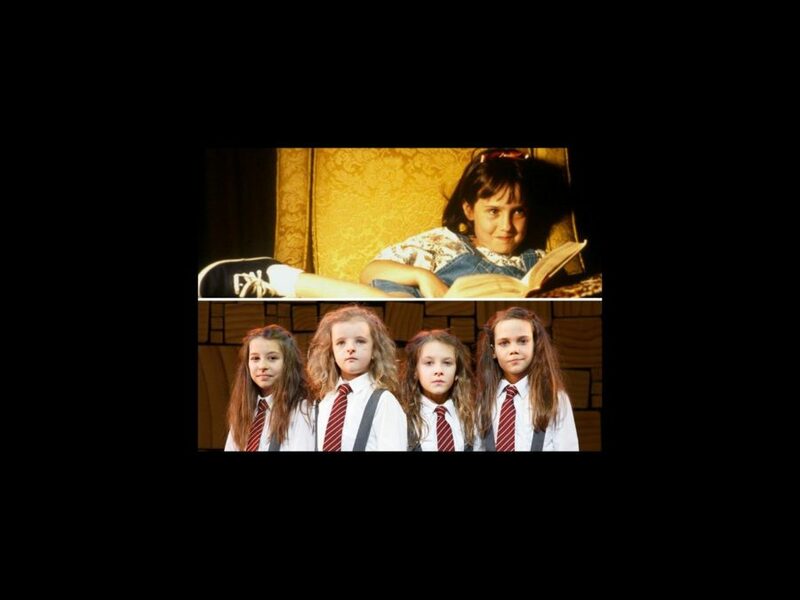 An immediate sold-out hit, Matilda won seven 2012 Laurence Olivier Awards, including Best New Musical, Best Director for Warchus, Best Actor for Carvel and Best Actress in a Musical for the four young girls who shared the title role. In February 2012, producers announced that Matilda would open on Broadway in 2013. Carvel was the first to sign on to stir up trouble once again as the menacing headmistress alongside newcomers Sophia Gennusa, Oona Laurence, Bailey Ryon and Milly Shapiro alternating in the title role. Lauren Ward reprises her West End role as Miss Honey in a cast that also includes Gabriel Ebert and Lesli Margherita as Mr. and Mrs. Wormwood. 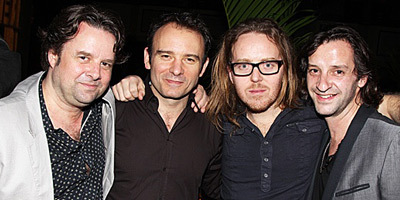 "I didn’t expect to write a musical that went to Broadway," Minchin told Broadway.com in a Making Matida video, though he admits that his witty score—from the opening number "Miracle" to the hopeful anthem "When I Grow Up"—has a modern feel. "It isn’t contemporary in the sense that I’m trying to draw from Justin Bieber, but it’s not like kids’ musical theater from days gone by… The final song is, 'We are revolting children living in revolting times.'" Meanwhile, everything from from Rob Howell’s alphabet-inspired set design to the title character’s scenes in the library honors Dahl’s celebration of the value of books. The focus of the show is more on the plight of the young heroine than her "special powers," with her first display of telekinesis not appearing until the second act. As Matilda began previews at the Shubert Theatre on March 4, Warchus described the challenge of the multigenerational musical to Broadway.com: "Roald Dahl is never writing in the mainstream; he's quirkier than that. He's got sharper edges. We didn't want to betray Roald Dahl or alienate the audience." Now, after years of work, the show's creators feel they've got the balance right. "The show’s visually extravagant and the characters are extreme, but those aren’t empty treats," Warchus says. "The story has a lot to say about life and putting the wrongs of the world to right." Matilda opens at the Shubert Theatre on April 11.